Toddlers are made up of two rooms, the full time Hedgehog room and the term time Badger’s room. Both rooms strive to set out exciting and inviting environments for children and parents. In both toddler rooms we structure planning and use assessment tools according to the Early Years Foundation Stage. With every activity created in our learning environment children’s interests and needs are paramount. Both toddler rooms have a key person and buddy system in place which ensures that each child has a familiar face to take care of their personal needs, liaise with parents and to keep track of their development. The buddy system is in place to ensure that the key person roll is covered in case of staff holiday and sickness. 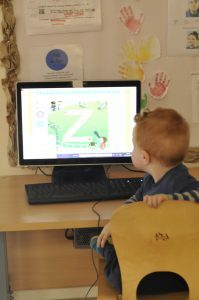 Each toddler room is staffed with both full time and part time practitioners with qualifications ranging from Level 2 nursery assistants to Foundation Degrees with many staff having a Level 3 or above. Both toddler rooms are made up of many areas and elements such as sand and water areas and other sensory activities. 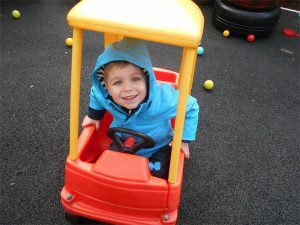 We use these areas to build physical and social skills such as filling and emptying as well as interacting with the other children, communicating and developing the skill of turn taking. The Messy Play areas allow children to explore different textures, materials and mark making equipment so that children can create masterpieces. Both toddler rooms have a cosy area, made comfy with material and pillows where children are able to relax with a story, have some quiet time or join in with song time throughout the day. Each room also has a range of small world objects, a farm yard, dolls house, a train track and a car garage. We have a large range of construction resources to develop the use of and strengthen small muscles to promote physical development. Along with all of these fantastic opportunities of learning we have sensory and loose play parts such as water beads, shells, pine cones and other textural objects to promote communication and language. We have a large role play area which is where our children are able to transfer their knowledge, understanding and experiences from home. Toddlers have a garden, this is used as an outside learning space where our planning from inside the room is reflected allowing the children to have the same opportunities inside and outside. Each Toddler room has a set of toilets and nappy changing facilities which encourages children’s interests in toilet training. Hedgehog room is a full time room and therefore later on in the day the cosy area is turned into a sleep area. To develop children’s understanding of the wider environment we use the ‘Hilary Bus’, this enables us to take up to six children to explore the immediate locality. Providing children with knowledge of their surroundings and reinforcing familiar routines such as shopping, trips to the park and walks through the woods. The toddler rooms are able to provide children with new and challenging activities daily to build on their personal, social, emotional, physical and communication skills. Building on these prime areas enables children to become increasingly independent which helps us to ready them for their next transition, Pre-school.